Happy Easter! 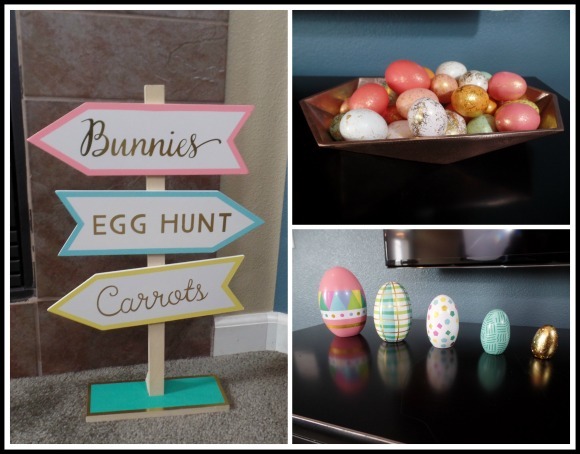 I have spent the last couple of weeks getting the house decorated for Easter, as well as planning out some fun treats and activities for the day. 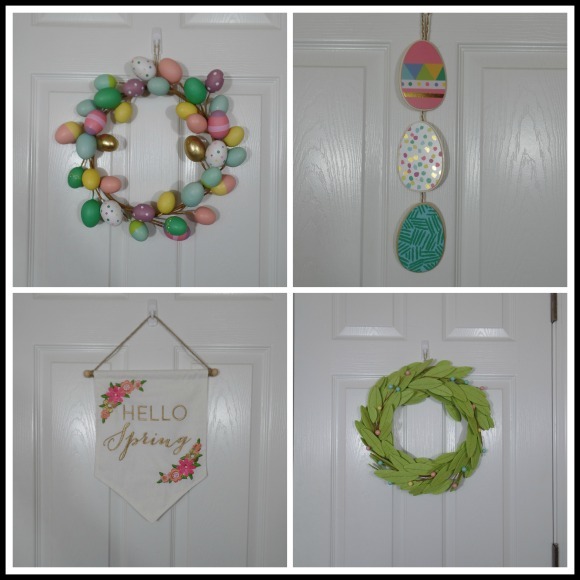 This year I updated some of my Easter decor, last year I decluttered some of the Easter decor I was no longer using, and this year I was able to update my decor with some inexpensive finds at Target's Dollar Spot as well as Targets Easter decor section. I loved all of the fun spring colors in the decor this year. Here is how I have decorated the house. 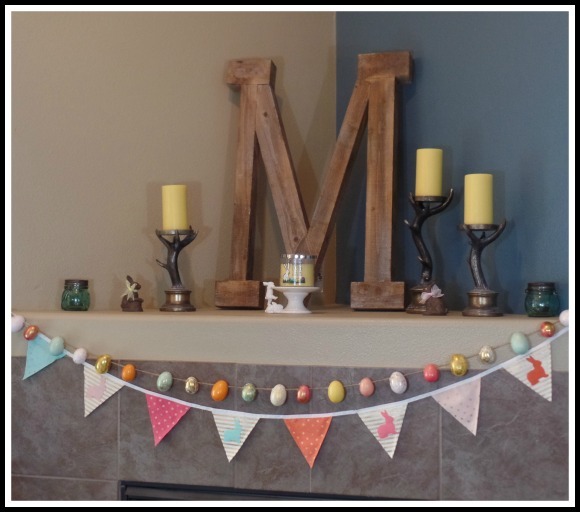 I put up some pretty foiled egg garland as well as a banner on the mantel. 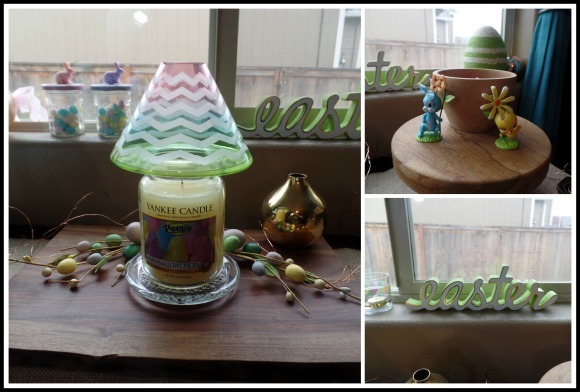 I put out yellow candles and a cute bunny candle holder from Bath and Body Works. I love yellow this time of year. 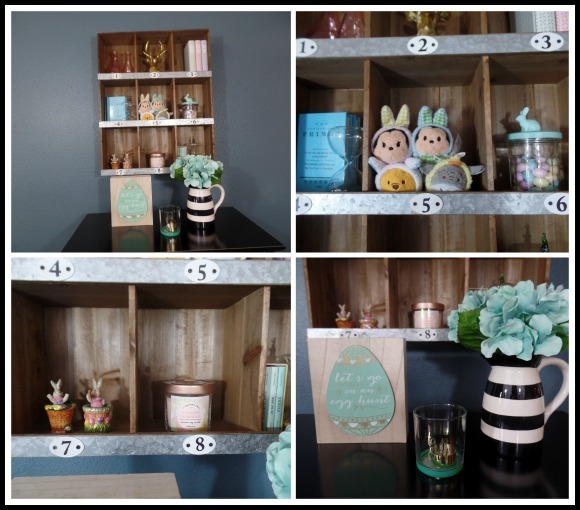 I have also added some Easter touches to my little cubby shelf. Since a lot of the decor is from Target it all coordinates nicely with pastels and touches of gold. I have different banners and wreaths on the doors throughout the house. I always have out seasonal decor in my dining room, I always have fun decorating this room. 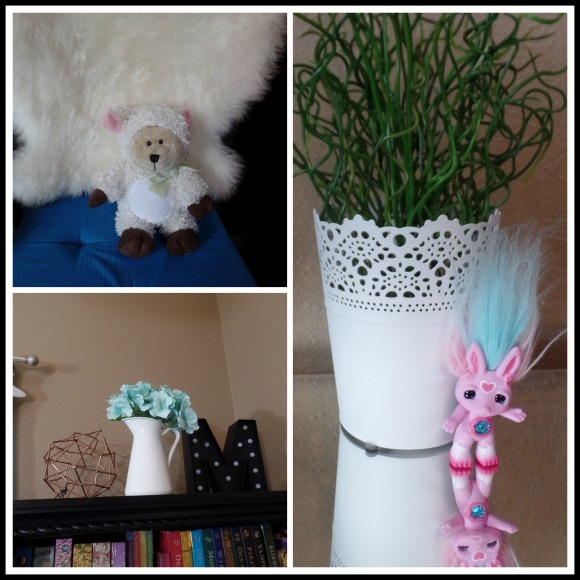 I tucked in a few of my whimsical toys and dolls throughout the decor as well which I think is fun. 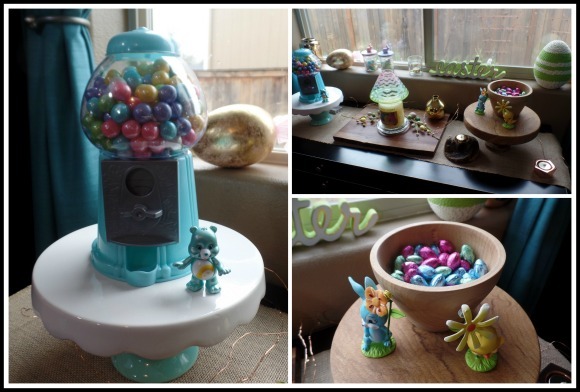 I found the cutest pastel and pearlescent gumball machine at Toys R Us and thought it would be a fun touch for spring. I plan on leaving it out throughout the spring and summer. 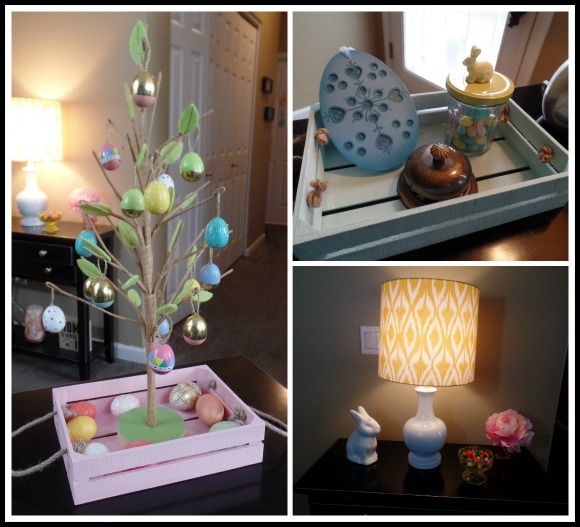 You can check out a video tour of my Easter home on my YouTube channel. I also found fun Easter treats throughout the last couple of weeks. Krispy Kreme doughnuts always have fun seasonal doughnuts and we have fun seeing what they come up with for each holiday. The Easter doughnuts were cute. 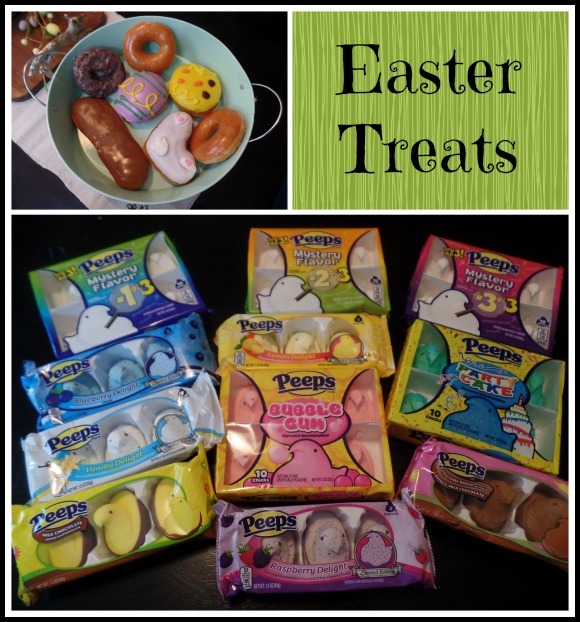 :) I also found a dozen different flavors of Peeps, as well as three mystery flavors. I did a fun taste test with all of them, and we plan to rate them together as a family on Easter evening. I spent the day before Easter making a few fun treats for Easter day. I was inspired by a vlogger called Zoella to make Easter Nests and candy filled crispy rice squares. I decided to use Chow Mein noodles coated in melted chocolate chips. I used two bags of Chow Mein noodles and one bag of semi sweet chocolate chips and one bag of milk chocolate chips. I melted the chocolate in a makeshift double boiler, then poured it over the Chow Mein and mixed until they were all thoroughly coated. I dropped them by large spoonfuls on wax paper and pressed in three jelly beans. I also shaped them to be nest shape. Then let them harden for a few hours. 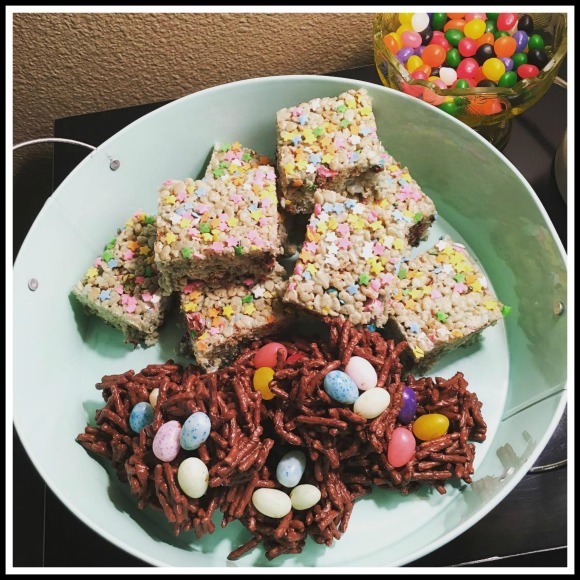 I also used the classic recipe for crispy rice squares, but added a little blue food coloring, as well as a bag of crispy Easter M&M eggs, and topped it with spring colored sprinkles. I love the way they turned out. My daughter just got back from her spring break mission trip, and my son is still en route back from California where he was meeting his girlfriend's family. My son should be back in time for Easter dinner, it will be strange not celebrating with him in the morning. But I have to get used to having older children now off doing their own things, so its definitely an adjustment! I hope everyone has a nice Easter! Happy St. Patrick's Day! 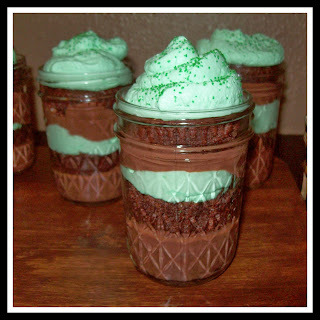 I love celebrating St. Patrick's Day every year, it is such a fun spring holiday. Today the sun is shining bright and the sky is blue, I love it when the sun pours through the windows! I have one of my corned beefs in the pot on the stove cooking away, and my lime St. Patrick's cake in the oven. After the cake is out, I'll put in the Irish soda bread, then put the second corned beef in the oven roaster. 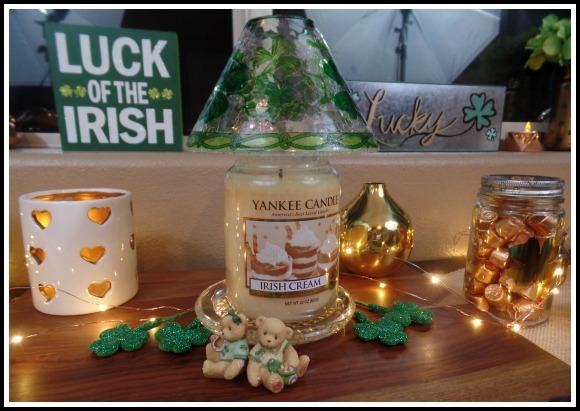 I have put out my decorations for St. Patrick's Day, so I thought I would share a few pictures. I set out all of my decorations from years past, as well as some of my new decorations. 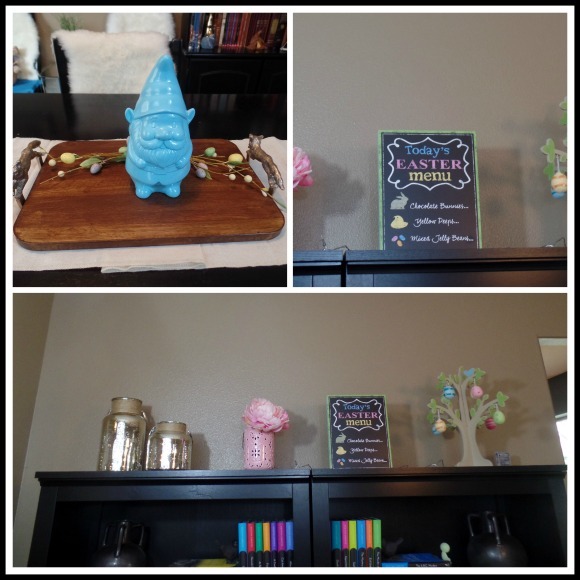 This year I only decorated the dining room, since Easter is only a week away I'll have to swap out my St. Pats decor tomorrow and get ready for Easter since it is so early this year. 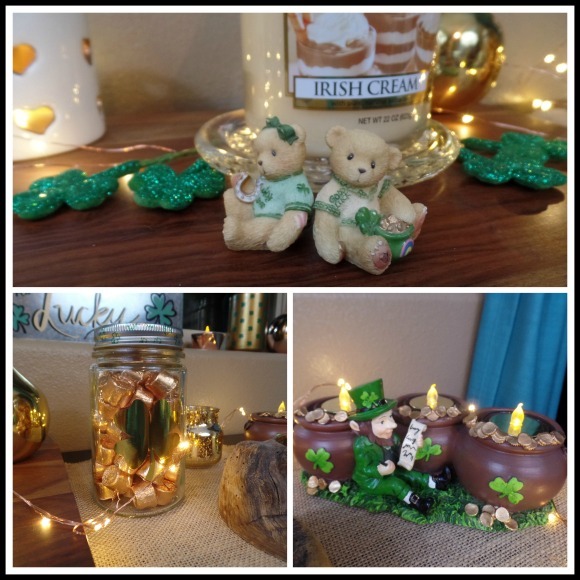 Even though Easter is so soon this year I still wanted to decorate for St. Pat's day since our whole family loves this holiday so much. 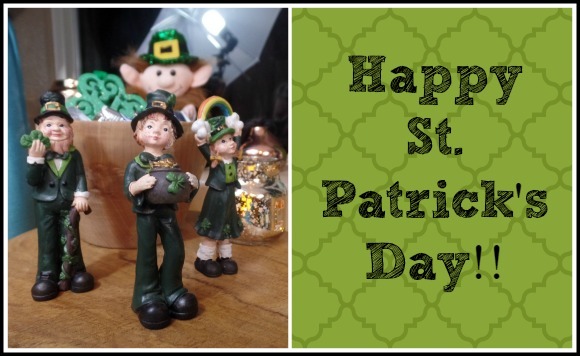 I have also recorded a short video tour of my St. Patrick's decor for my YouTube channel which you can see below. We will be spending the rest of the day preparing our dinner as well as watching some of our favorite St. Patrick's Day movies. I will also be helping my kids get packed for their spring break adventures, my daughter is going on a mission trip with her college group to Washington, and my son is meeting his girlfriend's family in California and Arizona, so they will be off for a big adventure this Saturday, and gone for a whole week. I am definitely not used to them being gone for so long, and I am definitely praying they will be safe as well as have a great trip. I will be spending most of next week working on my spring projects that I hope to wrap up before Easter! I hope everyone has a wonderful St. Patrick's Day! About half way through January I got back on track with meal planning, and as a result my grocery budget has really trimmed up quite a bit. 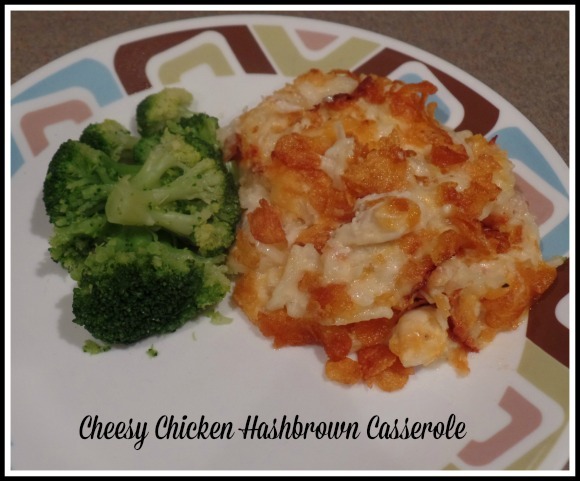 One of my favorite recipes from last month was my Cheesy Chicken Hash Brown Casserole, so I thought I would share my recipe. 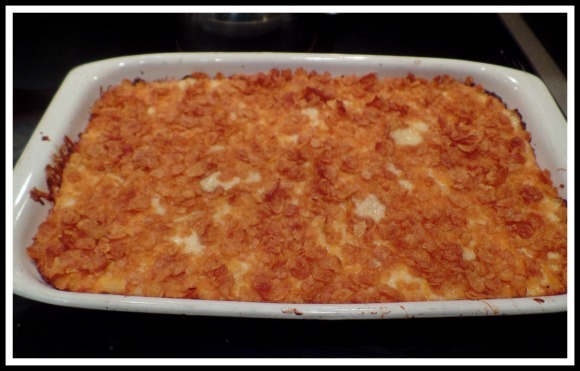 I first tasted a version of this cheesy hash brown casserole at my great grandpa's funeral years ago. A large portion of my family on my mother's side is Mormon, so we travel to Ogden, Utah for the funeral. It was the first Mormon funeral I had been to, and the church community provides a beautiful potluck style of meal after the funeral. 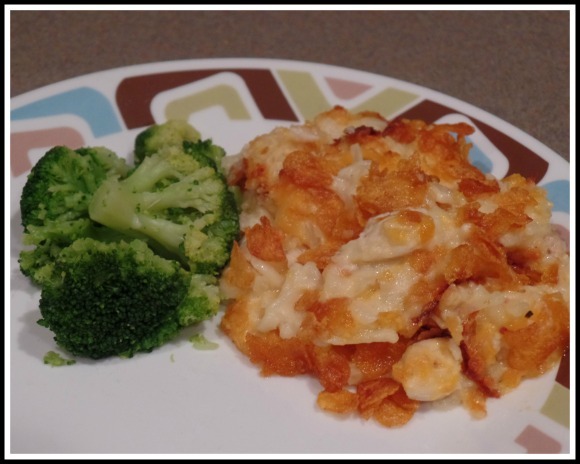 One of the classic dishes, I have come to find, is a cheesy hash brown type casserole as a side dish, which is even sometimes called "funeral potatoes". Anyway, I loved the casserole and learned the recipe, and have made it for potlucks at church many times. I decided to turn this casserole into a main dish by adding a good portion of chopped steamed chicken tenderloins. By the way, this is a double recipe for a large sized casserole, I like to make a big casserole since I am often feeding 5-6 adults/teens at each meal, and I like leftovers for lunch. 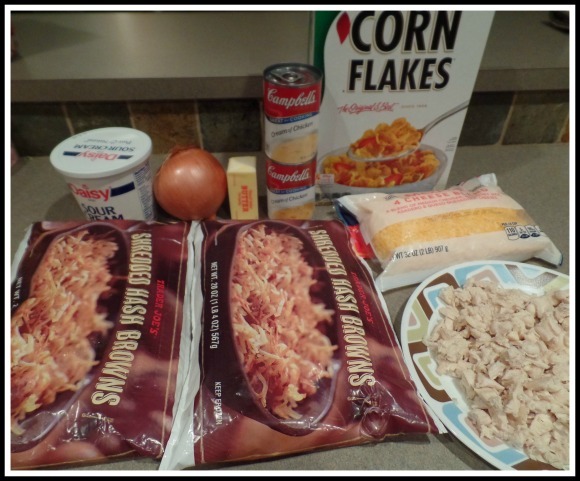 1 1/2- 2 cups of cornflakes for topping. Gather your ingredients, be sure your hash browns have sat out for at least half an hour before you prep this casserole, they need to be slightly thawed out so they will break apart and not be in a big frozen clump. Chop your onion and saute it in 4 tablespoons of butter, saute your onions in a large pot that will be big enough to stir together all the ingredients later. This is a lot of butter but it is part of the recipe and will be stirred in with everything else. 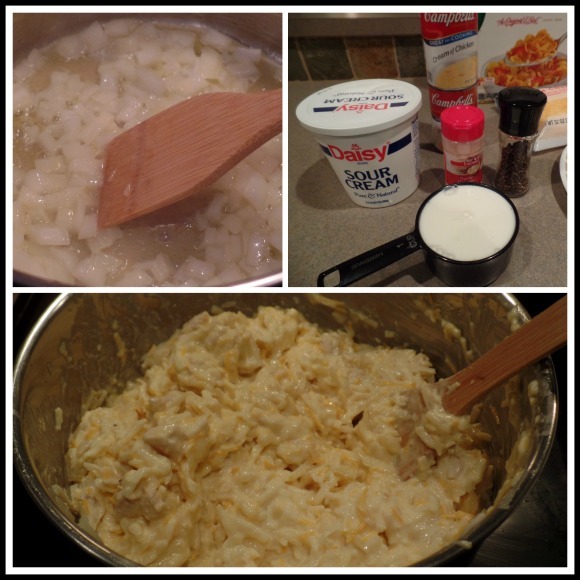 When the onions have softened and are translucent but not browned take it off the burner and add hash browns, chicken, both cans of soup, one cup of milk (you may need a 1/4 cup more if casserole seems to need it) and 1 cup sour cream along with about 1 cup of shredded cheese (you may want a bit more). Then add between half a teaspoon to 1 teaspoon of garlic powder depending on your preference, then salt and pepper to taste, you don't need much salt because the cheese and soup mix are salty. When casserole is thoroughly mixed transfer to a large greased baking pan, a lasagna sized pan would do well for this size recipe. Top casserole with another cup of grated cheese lightly cover with foil and bake at 375 F. for about 45 minutes to an hour. Casserole is cooked through when potatoes are cooked through. 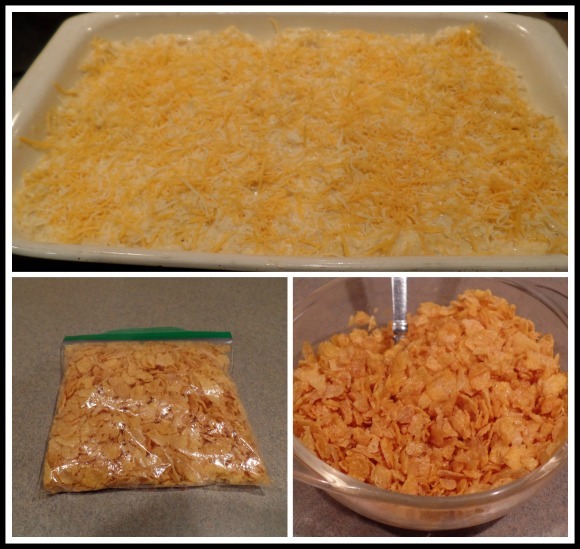 While casserole is baking make the crunchy topping. Apparently there is often quite a debate about whether or not cheesy hash brown casserole should have at topping or not, I have made it with a topping and without, and I like it both ways. Since this was a main dish dinner casserole I though a topping would be nice. So I melted the other 4 tablespoons of butter and put about 2 cups of classic corn flakes in a ziplock sandwich bag, I slightly crunched up the cornflakes, then transfered them to a small mixing bowl and tossed with melted butter. When casserole is close to done remove foil, and top with crunchy topping and return to oven to bake until golden and crispy, about another 15-20 minutes, checking frequently so topping doesn't burn. Because of the potatoes and cheese this casserole will be very hot, so it is nice to let it cool for a bit, especially for children. I like to serve this casserole with a nice serving of steamed broccoli. The whole family loved it and it made for excellent leftovers as well! If you would like to check out my latest meal plan and grocery haul check out this video below from my YouTube channel. 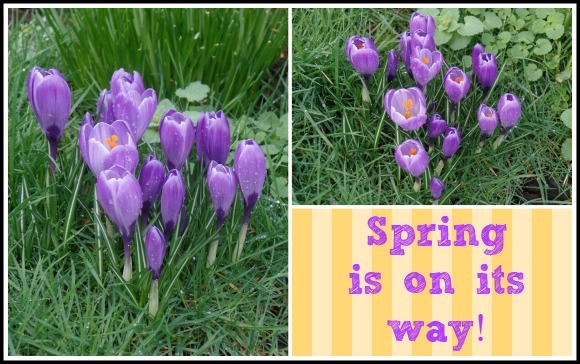 I am excited this week as my garden has been showing signs that Spring has arrived, the crocus are blooming and other flowers are starting to bud as well. My backyard birds have been very active at the feeders which I always enjoy, we even had a large hawk land in the yard last week! As soon as our spring rains let up I will be eager to prep my veggie beds and plant some more spring flowers.